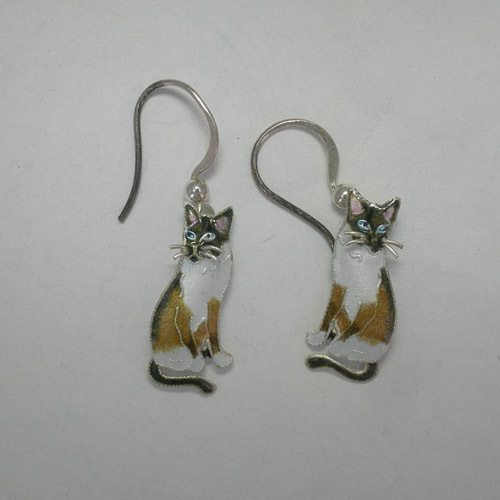 Desc: Sterling Silver enamel Snowshoe Siamese dangle earrings. The earrings dangle from Sterling Silver French wires. Each earring is fashioned to resemble a Snowshoe Siamese cat. The earrings have vibrant black, brown, white, blue and pink enamel. The Snowshoe Siamese cats are sitting with tail wrapped around the body. The whickers are fashioned from Sterling Silver wires. Each cat has beautiful blue eyes and pink ears. The earrings have bright polish finishes.